Jakarta is a little South of the equator, the Indonesian climate is tropical. Water cooling is problematic because of the high ambient temperature, the performance of liquid ring pumps is strongly reduced in terms of capacity and vacuum level. 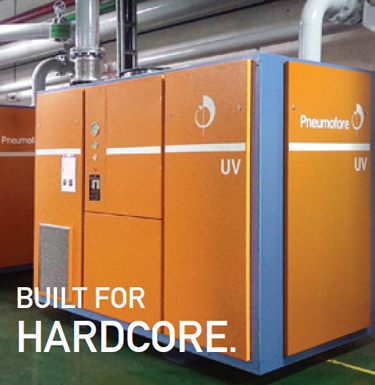 In order to succeed, air cooled machines must be specifically designed to operate in hot climate. Also the choice of screw vacuum pumps failed. The ultimate solution were two UV50 vacuum pumps, commissioned in March 2010. 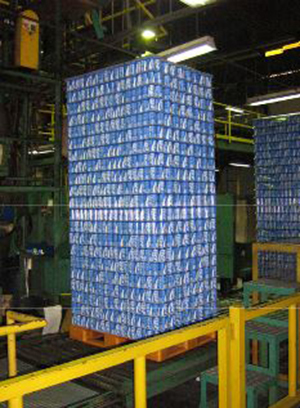 The production of cans is a clean application of vacuum. Nowadays, most can plants have centralized vacuum. Capacities are high, in this case we consider 6.000 m3/h [3536 cfm]. The unexperienced choice frequently falls on large liquid ring vacuum pumps, initially cheap to buy, but expensive to operate. These pumps come without motor, electricaland power-panel are usually separate and cooling water circuit must be tailor-made for every single factory. Cooling towers and water treatment devices are additional mandatory components. After placing water pipelines, cooling tower, cement foundation for the pump body, electrical wiring and chemical monitoring, pH value adapting, finally the liquid ring system can operate. Large liquid ring pumps start running continuously 24/7, but with 35°C [95°F] ambient temperature their nominal capacity is reduced by 65%. Expensive to install and to run, not satisfactory in terms of efficiency. 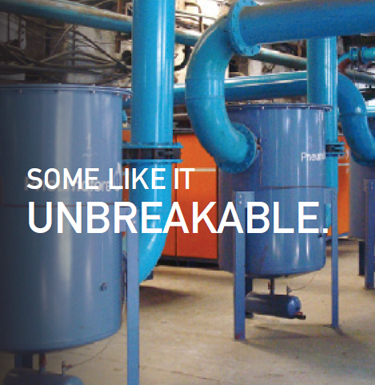 Running cost analysis over years identifies such a vacuum system as major expense. Cooling water circuits, heat exchange devices and water flow in pipelines, all loose in performance. The search starts to find an air cooled solution. The low knowledge about vacuum, its confusion with “simply the opposite of compressed air” sometimes leads to wrong choices, just to abandon the huge costs caused by the liquid ring vacuum pump system. And that is how screw pumps are installed, unfortunately the manufactures themselves have little know-how about vacuum, to the point that most screw vacuum pumps are delivered with an oil pump to make the lubricant circulate, although vacuum itself could manage. The missing active sealing on screws, the impossible repair of the air ends, their forced replacement (usually at high cost) and the missing serious consideration of tropical climate circumstances for the electrical motor reliability, cause considerable troubles. The lack of vacuum in a can production site has drastic consequences, sometimes there is no time to fix, simply new pumps are added. This screw pumps scenario, often ending with water cooling, due to insufficient heat exchange capability, does not represent an improvement, compared to the previous situation with liquid ring pumps. The described sequence is quite popular, vacuum is a “secondary energy”, just a facility. But the repeated unsuccess motivates to contact colleagues, who faced similar circumstances. Some engineers will never admit their incompetence, others will hunt a long term solution. Target is to have always sufficient vacuum-capacity and -level in the production, better if air cooled and mandatory reliable and durable. Here is where Pneumofore appears. 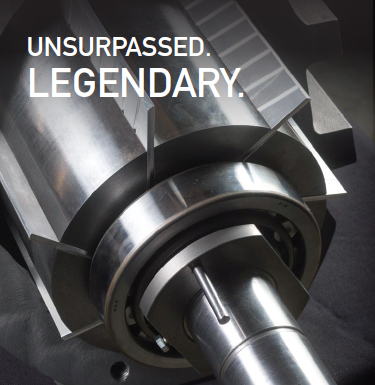 With hundreds of centralized vacuum systems on five continents, we collected experiences over more than 85 years. 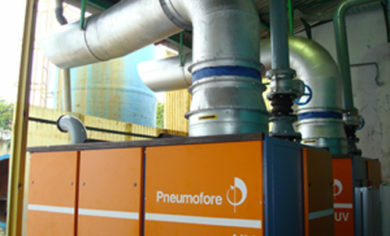 In this specific case of United Can, the engineers of Pneumofore analyzed the requirements and, after long discussions, two UV50 HC were delivered, obviously air cooled but specifically for Hot Climate (HC), with a larger sized motor of 110 kW each and a dedicated heat exchanger with proportionally dimensioned fan. One of the two pumps is further equipped with a variable speed (VS) device of ABB, which keeps the precise vacuum level in production, covering all the fluctuations of vacuum need, that may appear. The vacuum level was improved from 450 mbar(a) [16,6 inHg V] to 250 mbar(a) [22,5 inHg V], having the UV50 HC VS unit running at 35 Hz, which is the lowest possible frequency, as the range goes up to 60 Hz. 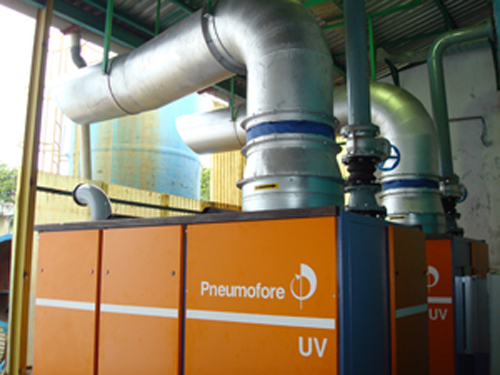 Like many other UV pumps near the equator, these two are meant to run continuously for the next few decades, with low power consumption, little need of maintenance, simply with the lowest Life Cycle Cost.